If you have decided to get a vacuuming robot and you are considering either an iRobot Roomba or Neato Botvac, you might find this article helpful. We will compare here two excellent and affordable vaccuming robots of each brand. iRobot has produced a number of Roomba robots that range from the most basic to the most sophisticated, the top models being quite expensive. If you don't want to pay the higher prices of the top Roombas, but still want to have a Wi-Fi supporting Roomba with a set of features that will satisfy the cleaning requirements of most homes, you might want to consider Roomba 690 and 890. Similarly, Neato has also produced a number of Botvac robots that come with different sets of features. If you don't want to pay the higher price of the top Botvac, but still want to have a Wi-Fi supporting Neato Botvac with a set of features that will satisfy the cleaning requirements of most homes, you might want to consider Botvac D3 and D5. This article will compare Neato Botvac D3 & Neato Botvac D5 with iRobot Roomba 690 & iRobot Roomba 890. With Laser Smart technology on both Neato Botvac D3 and D5, these robots scan each room 360 degrees, identifying furniture, doorways, and stairs in order to avoid them. They then create a map, planning the most efficient course and methodically clean the mapped space, moving from room to room in the most efficient way. ​Advanced laser floor plan mapping and navigation means a deep, thorough and methodical cleaning in less time with good precision as the robot cleans room-to-room, recharging automatically to complete the entire floor. Continuous scanning of the room while cleaning keeps the robot aware of any changes in the room to ensure that it’s still cleaning on an efficient path. Neato robots see, sense, and respond to furniture, toys, and stairs, carefully moving around them without missing a spot. Note that these robots can also navigate well in rooms with little to no light unlike other navigation systems. The SpinFlow Power Clean technology found on both Neato Botvac D3 and D5 combines potent suction and precision brushes to easily remove dirt, hair and debris from all floor surfaces, including hardwood, tile and carpet, leaving the floors and carpets immaculately clean. Botvac D5 is equipped with a combo brush and a side brush, while Botvac D3 is equipped with a combo brush, but it has ​no side brush. The combo brush offers superior pick-up of pet hair on all floor types, reduced noise during operation, and is ideal for homes with multiple types of flooring. It is easy to remove and maintain. Note that Neato’s unique D-shape and patented Corner Clever technology means that the robot moves deftly into corners and along walls where dirt and crumbs often hide. Both Roomba robots use a single spinning side brush that cleans along wall edges. When all four robots considered here are connected via your home's Wi-Fi to internet, you can use their associated free app for Android and iOS to invoke remotely operations such as cleaning, scheduling, etc. from wherever you are, using your smartphone or tablet. ​Note also that these four Wi‐Fi connected vacuuming robots are compatible with devices that run Amazon Alexa, and therefore they can be voice controlled. Simply ask Alexa to start, stop, or dock your robot. Roomba 890, Botvac D3 and Botvac D5 provide indications when the bin gets full. Roomba 690 does not, but as long as you empty the bin after each cleaning, that should not be a major problem. ​Note that if the vacuuming job planned by the robot was not completed, both Botvac D3 and D5 resume automatically the job after recharging. ​Roomba 890 and Roomba 690 need to be restarted after they recharge, if further vacuuming is required. ​The Neato Botvac D3 and D5 robots resume the cleaning job automatically after they recharge themselves, and they continue in this fashion until their cleaning cycle is completed. One Neato Botvac cleaning cycle includes 3 cleaning runs with 2 recharges of the battery, which is enough in most homes to clean an entire level. Though the square footage cleaned per cycle by these robots may vary based on floor type, room layout, furniture, etc., Botvac D3 and D5 can vacuum in one cycle approximately up to 1800 sq. ft. and 4500 sq. ft., respectively. These numbers are large enough to represent an entire level in most homes. Roomba 890 and 690 need to be restarted after they recharge themselves, if more cleaning to complete the job is required. The average run time for these Roomba robots is about 60 minutes at full charge. If the area to be cleaned is not very large, that may be enough to vacuum the entire area. But for very large multi room areas to be cleaned, if the robot needs to recharge itself during the cleaning, these robots may need to be restarted more than once. All four robots considered here allow invoking the spot cleaning function that forces the robot to concentrate on cleaning thoroughly a particularly hard-to-clean spot. Note the however that the battery on Botvac D5 is a High Capacity Lithium-Ion battery which is more powerful and can provide, when fully charged, more than twice longer run times than the battery on Botvac D3. ​Note also that Lithium-Ion batteries provide longer run times than Nickel Metal Hydride (Ni-MH) batteries for a comparable amount of work load, and last longer before needing to be replaced. All four robots considered here can be controlled and scheduled remotely from wherever you are, using your smartphone or tablet. Both Botvac D3 and D5 robots are compatible with Boundary Markers that can be stretched across doorways or areas that the robot is not supposed to cross. But note that, while the purchase of Botvac D5 includes a Boundary Marker, the purchase of D3 does not. Boundary Markers can be obtained on Amazon as required (see Amazon products section below). Both Roomba robots considered here use Dual Mode Virtual Wall Barriers to prevent the robot from crossing doorways, but these stand-alone devices can also be used as "Virtual Wall Halos" to protect some restricted area within the room, like for instance the area where the dog food might be. Note that Dual Mode Virtual Mode Barriers require 2 AA batteries that are included in the purchase of the robot. The "D" in the dimensions refers to diameter, "H" to height, "L" to length and "W" to width. All four robots considered here come with a 1-year limited warranty on the robot, and a 6-month warranty on the battery. So which of the four robots considered here should you get? Botvac D5 is more desirable than Botvac D3 as it has a more efficient ultra-performance filter that can deal better with pet hair, debris and particles, and it has a more powerful battery that allows the robot to run more than twice longer than Botvac D3. In addition, Botvac D5 is equipped with a side brush, while Botvac D3 is not. Finally, Botvac D5 comes with a Boundary Marker, while Botvac D3 does not (you will need to buy one separately, if needed). Roomba 890 is more desirable than Roomba 690, because it can deal better with accumulated debris, as it is equipped with more efficient and powerful brushes, known as debris extractors, that grab and break down debris eliminating hair tangles and jams. In addition, it is equipped with an AeroForce high efficiency filter that can deal better with hair, particles and dirt. Finally, Roomba 890 indicates when the bin gets full, while Roomba 690 does not. 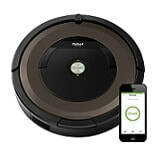 - Neato Botvac D5 uses the more accurate laser technology to map and plan the area to be cleaned, while Roomba 890 relies on its sensors to decide where to go. 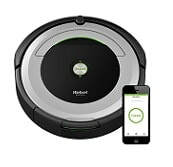 - Neato Botvac D5 does not require to be restarted after it recharges itself, and it resumes the job until its cleaning cycle is completed, while Roomba 890 needs to be restarted after a recharge, if more cleaning is required. - The Boundary Markers used by Neato Botvac D5 to prevent the robot from crossing doorways do not require batteries, while the Dual Mode Virtual Wall Barriers require 2 AA batteries to run (included). - Roomba 890 is equipped with dual main brushes that can deal extremely well with dirt and debris, while Botvac D5 is equipped with a single combo main brush. - Roomba 890 is equipped with both acoustic and optical sensors which allow the robot to find dirtier areas and spend more time cleaning them. - Dual Mode Virtual Wall Barriers can be used not just to prevent the robot from crossing doorways, but also to protect some restricted area within the room, like for instance the area where the dog food might be. - Roomba 890 is thinner than Botvac D5 (3.6 inch vs. 3.9 inch), and therefore, it can go easier under low lying furniture.